Whether you are a martial artist, want to do the splits, or just want to be more mobile, flexibility is important. This is especially important with leg flexibility. As a matter of fact, a scientist in Brazil developed leg flexibility exercises that could possibly predict how long you will live. Leg flexibility is extremely important because it encompasses pretty much the whole lower body, from your lower back, to your glutes, to your hamstrings. Obviously, flexibility can be gained from regular stretching or doing yoga. However, if you want to make your life easier or want to take your stretching to the next level, try using leg stretching machines. 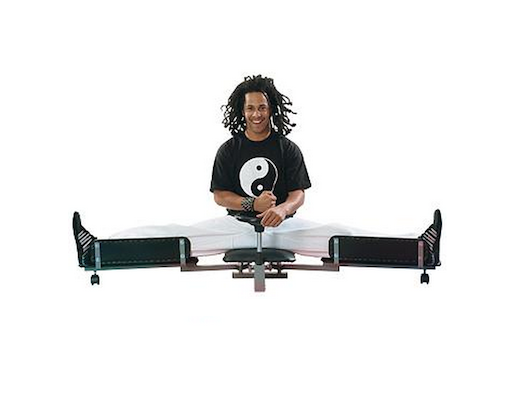 We have reviewed 7 of the best leg stretchers available. So whether you are a martial artist or just someone that wants to be more flexible, have a gander. We have also added a sortable table below along with a table of content for easier browsing. Easily one of the most expensive yet versatile leg stretching machines on the market today. 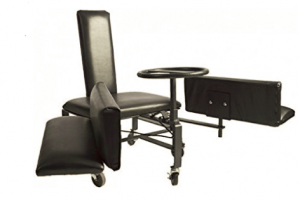 This stretching machine has a steering wheel to control how far you want your stretch to go, padded vinyl to make your stretching comfortable, and back support with adjustable angles. 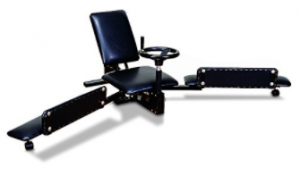 Best of all, the Tiger Deluxe Leg Stretching Machine comes fully assembled, except for the easy step of attaching the steering wheel to it. Therefore, there is no need to mess around with screws and nuts. The nice thing about this machine is that you are able to take the wheel off to lean forward on your stretch.This machine has no limits to how far it goes—meaning it will go past 180 degrees (what is considered a split). However, this leg stretching machine has no gauge for its user to track the angle of their stretch over time. Some users also suggest greasing the attachment portion of the wheel to allow it to rotate more smoothly. Century is a well known manufacturer of martial arts gear and training accessories. Their leg stretching machine is called the VersaFlex. Their VersaFlex does not come pre-assembled. However, they have multiple features that makes their machine unique. One great feature offered by the VersaFlex is an angle gauge for the user to monitor their flexibility level over time. Their thigh pad is removable and can be placed in three different positions. This pad can also rotate in its place, which is great for adjusting your leg to a comfortable position. Another attribute that is helpful for increasing the ability to stretch are handle bars that can be placed on the side of the leg placement. The VersaFlex uses a ratchet and cable system with a lever to increase the angle of stretch. This design forces the user to stretch at specific increments that is not as small as the ones with a steering wheel. There is a small release lever that allows the user to bring their legs back to the starting position. To do so, activate the release lever by pulling on it and the main lever back as you move the leg sections together with your legs. The VersaFlex back support does not have much of a surface area to lean on and you cannot adjust its angle. 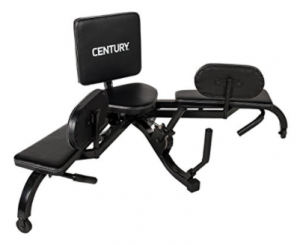 This VersaFlex 2.0 stretching machine from Century has a solid metal frame for long lasting durability. Century increased the size of the back support in their 2.0 version. Like the original VersaFlex, this model uses a ratcheting mechanism and cable system to spread the user’s legs apart. The leg side padding can also still be positioned at three different locations to accommodate and makes it easier to adjust between users. Another great feature of the 2.0 model is the handlebar present up front and on each sides of the stretching machine to facilitate the stretching experience. The padding cushion between this model and the previous one is the same, which means that the VersaFlex 2.0 is not as pleasant to sit on as some of the other brands on this list. Tall users suggest that the length of the leg support for the VersaFlex 2.0 could be longer. Assembly is also required with the VersaFlex 2.0. A consensus among its owner is that the provided instruction manual is not very clear, therefore users may find it frustrating to assemble the VersaFlex 2.0 together. 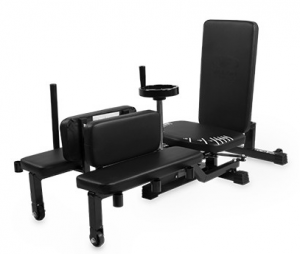 Stretch4All Leg Stretching Machine is a handcrafted product with a frame composed of solid steel. This budget friendly item comes pre-assembled and simply requires the user to place the steering wheel in place. Like the other models on this list, the steering wheel is removable. The Stretch4All uses a power cord system to adjust the machine’s leg separation angle with great incremental control. This cord is visible in the image above. This stretching machine is extremely comfortable with the thick cushions provided. The leg supports are also removable which is great for reducing the space required for storing this Stretch4All product. One feature that differentiates the Stretch4All from the other stretching machines is how it has wheels underneath the chair. Other machines have a immobile base or simply two wheels on the back of their base support. This feature helps make the Stretch4All the easiest option to move and store away. To prevent their stretching machine from constantly moving around, its wheels does have a locking mechanism. The Stretch4All has a nice tall back support. Additionally, the purpose of its narrow width is to allow its user the ability to do arm stretches as they are stretching their legs as well. The only major complaint about the Stretch4All is that it would be nice if it has longer leg supports. 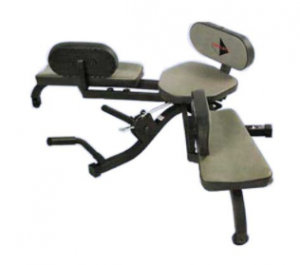 Valor Fitness CA-27 leg stretch machine is selected as Amazon Choice item. This product requires minimal assembly and greasing of specific components. A grease packet comes with the package. When ready to use it, simply stick the turning wheel in its proper place and position the side pads in one of two available slots. An impressive design component is how the CA-27 can go beyond 180 degrees. Plus, it spreads the user’s legs at small increments. The turning wheel is designed so that the user can turn it with one or two hands. The padding for the seat and leg rest is not thick, but its cushion is plenty comfortable for the the range of time used. The back support portion of the CA-27 can be laid flat. The steering wheel and the side leg pads are removal. These features make it easy for taking the CA-27 apart and storing it away. A downside of the CA-27 is its quality of construction and lack of sturdiness relative to the other options listed. The steering wheel wobbles as it gets turned. The CA-27 also has no stretch gauge so the user has to account for the number of wheel turns as a measuring method. 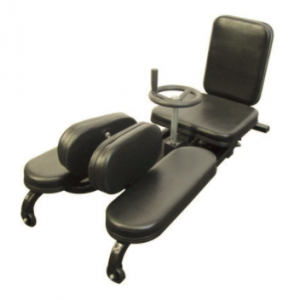 Overall, the CA-27 is a well-priced leg stretching machine that does its job. 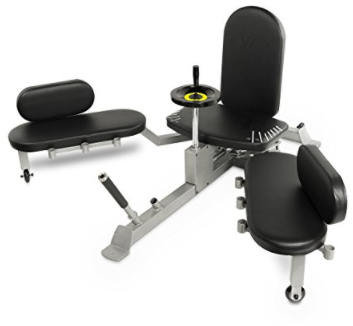 Another great leg stretching machine from Valor Fitness is the CA-28. Its frame is sturdier and more durable than the CA-27. The CA-28 has the same concept, but with an improved finish for better visual appearance. Even though the CA-28 does not have a stretch gauge like the CA-27, it does have markings on the seat to indicate the angle of stretch. The CA-28 has adjustable back support for changing the angles of the stretch. It also has 3 slots on each side of the leg support. This is great for being able to adapt the side leg padding and the handlebar for stretching assistance to be best suited for each user. These attributes is designed to be used in a gym environment, so this equipment should be able to withstand the daily home use. Its high density foam padding is ideal for long term durability. However, the downside of the padding’s density and thickness is its comfort level. Extremely flexible athletes should look into buying the CA-30 leg stretch machine from Valor Fitness. This option allows users to stretch up to an impressive 200 degrees. The CA-30 can also have its two leg sections positioned right next to each other, which makes it easier to get on and off the machine. Upon close inspection, the steering wheel of the CA-30 has grooves for easily gripping onto and turning it. Similar to the CA-28, this model has the stretch indicator marked on its seat as well. The stretch bar that comes with the CA-30 is extra long, which is great for different gripping and stretching adjustments. A great benefit the CA-30 has over the CA-27 model is that its has wheels located on the base support in the back, which has the benefit of making it easier to move the CA-30 once the user has completed their stretching routine. The only negative aspect of the CA-30 design is that its side padding sits in only one position. However, Valor Fitness accounted for this by providing a side padding that is extra long. Its back support is designed to be tall and narrow. This feature has the same benefit as the Stretch4All machine, which is to provide a great back support that also allows its user to perform arm stretches while stretching their legs at the same time. So there you have it. We have rounded up 7 of the best leg stretching machines on the market right now. Of course increasing leg (and lower body) flexibility doesn't have to involve a leg stretcher. However, it does make life a lot easier and makes you a lot more consistent knowing that you don't need a partner to push the limit of your stretches. If you are looking for some more reviews of the best martial arts products out there, go to our reviews section.